I wish I had some better photos of this dish to share with you. Photos which would show you just how how tasty it was, but it's hard to make a mixed bean bake like this look bonnie. It may not look beautiful. but it tastes amazing and I'll be making it again soon. We loved it. Well I say we loved it but Cooper, the fusspot, gave the critique that it was ok, but he would be happy with sausages and baked beans. Believe me, this is much nicer with a much richer flavour and adding the potatoes, oh yes! Now that is good! A whole meal on a plate, all baked in one dish. BOOM! To make this super-easy family meal. 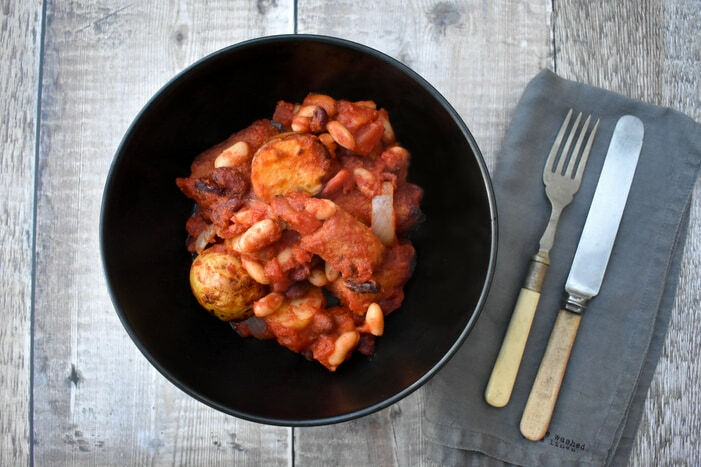 I roasted frozen veggie sausages (we like Linda McCartney sausages which are vegan) and halved baby potatoes in a ovenproof dish, then I added tinned (canned) chopped tomatoes, tinned beans and spices. This is my quick make, but you can always soak beans overnight if that's what you do. That is something I never do. I'm just too busy and to be honest not organised enough. I like tinned beans as they are convenient and good quality. I have a stock of lots of easy ingredients to help me make midweek dinner time a breeze. What's in my store cupboard? You know I love quick meals so these are the things I keep well stocked with for easy dinners. I've probably missed a few things out but those are the basics that help me pull together simple family meals. I also have baking ingredients and plenty of fresh fruit and vegetables. In my freezer I always have vegan sausages, vegan sausage rolls (the boys love these with baked beans) veggie mince, frozen spinach and peas, frozen herbs and some frozen berries when they are out of season. I love one-pot dinners like my cowboy beans, well I say one-pot dinners, but they are actually one-tray or dish dinners, but that doesn't roll off the tongue the same way. These are four of my favourite family bakes. 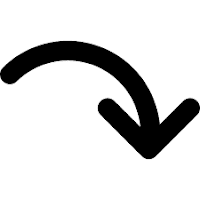 Running from top left clockwise. 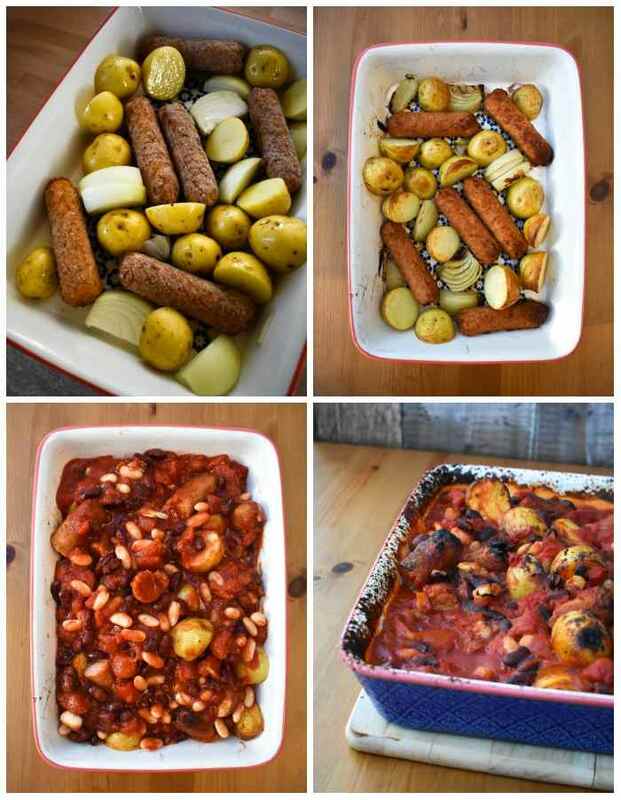 This is simple two step bake filled with vegetables, veggie sausages and chickpeas. It is healthy, filling and a real crowd pleaser. A comforting cauliflower cheese bake with a difference. Cauliflower and waxy baby potatoes in a cheese and spinach sauce topped with mozzarella and baked until golden. Veggie and vegan recipe. An easy vegan sausage and red onion bake in a rich gravy. A simple bake that's easy to make on a weeknight. Serve with mashed potato and peas for the ultimate comfort dish. A rich pasta bake that is so easy to make. The whole dish is made in a roasting pan. First you roast the vegetables, then you add the sauce ingredients and dried pasta. Pop it in the oven, walk away and 40 mins later voila. The most delicious pasta bake that everyone will love. Suitable for vegans. I hope you try these cowboys beans soon and let me know if you enjoyed them as much as we did. Definitely add the potatoes as those made it a complete meal and tasted so good. 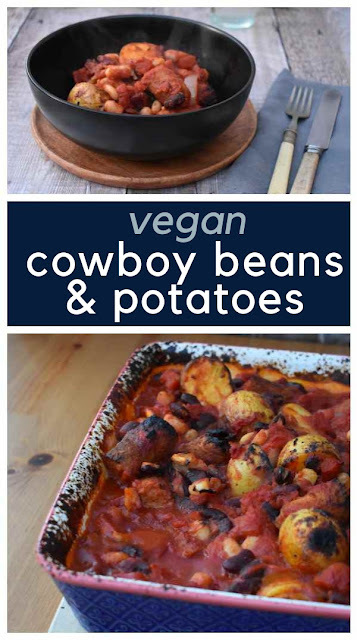 Remember if you make them to leave a comment under this post or on the cowboy beans pin over on Pinterest, If you take the time to leave a comment or photo of your dish on Pinterest, everyone can see it and more people will see the recipe as well, which is fabulous. I thank you in advance if you share comments or photos on any of my recipes. You can follow me on Pinterest as well as Facebook, Instagram and Twitter. I always love to chat. 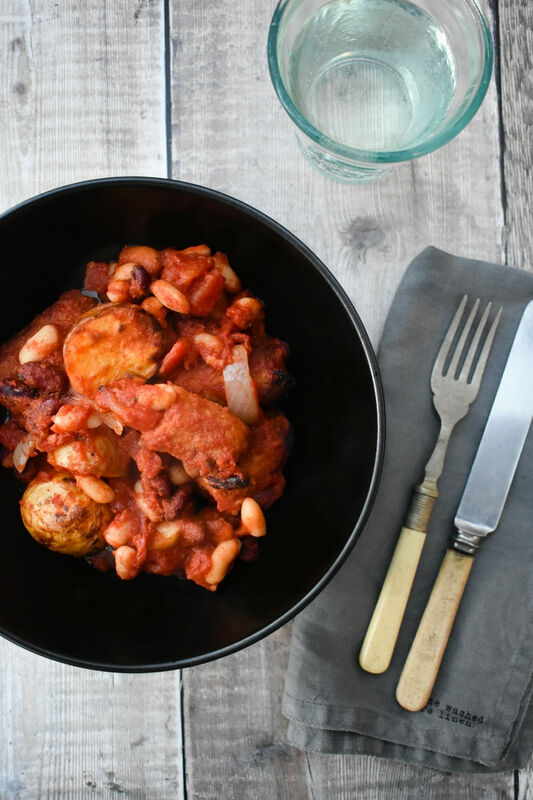 An easy one-pot bake of cowboy style sausages and beans with added potatoes. 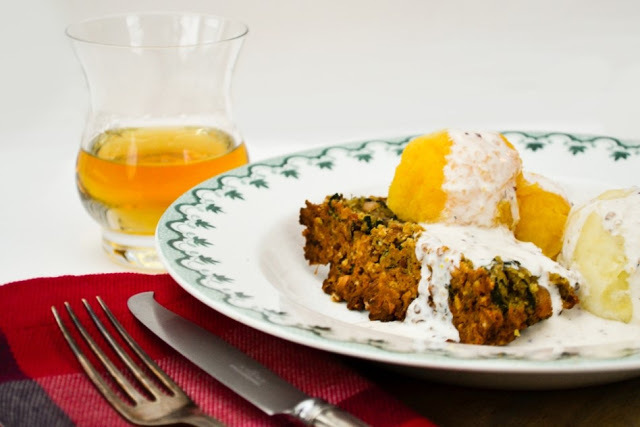 This simple recipe is a real family favourite and is suitable for vegetarians and vegans. Preheat the oven to 220c/200c fan/425f/Gas 7. Place the potatoes, onion wedges and sausages in a large ovenproof dish and drizzle with the oil. Use your (clean hands) to toss the ingredients in the oil, then spread out in an even layer across the dish and bake for 20-25 mins until the ingredients are cooked and starting to brown at the edges. In a large bowl, combine the chopped tomatoes with the tomato puree, sugar and spices then mix well. Add the drained beans and mix in. 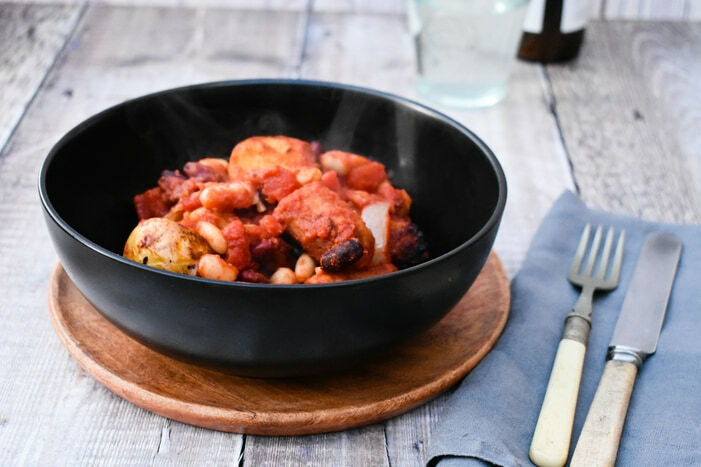 Remove the dish from the oven and carefully, cut the sausages in half, being careful not to burn yourself, then mix in the tomato bean mixture and pop back in the oven for 30 minutes. A wonderful nut loaf made with veggie haggis, red lentils, spinach, cashew nuts and spices. It tastes fabulous with a vegan whisky cream sauce, but it's also good with a creamy mushroom sauce or a fresh tomato and basil sauce. Looks delicious but oh heck how do you clean that burnt on dish afterwards?! Yes it was super tasty. I popped the dish in the dishwasher. It came out sparkling. Yes it is definitely fall or autumn as we say here and the ideal time for comfort food. Thanks for such kind words. They are super hard to photograph well. I love all the flavors in this dish! I haven't had vegan sausage before (only vegetarian) but I'll have to look for it! When we were a veggie family we ate these Linda McCartney sausages too. They are suitable for everyone and really good. now thats a hearty meal my boys will go crazy for I guess I better whip this up soon for them! Haha it sounds like you should. So so good! 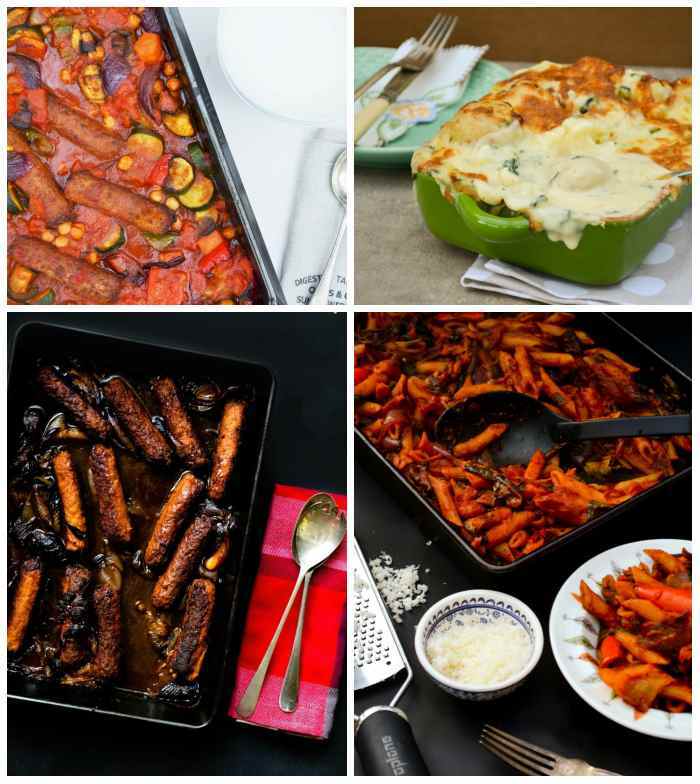 This looks like the most comforting thing, I love using vegetarian sausages in recipes too! They really are great in hearty dishes and a great starting point. Always a family pleaser. This is totally making my mouth water! It looks so good! Thanks Jessica it really is superb. I hope you try it. haha! I love the name! 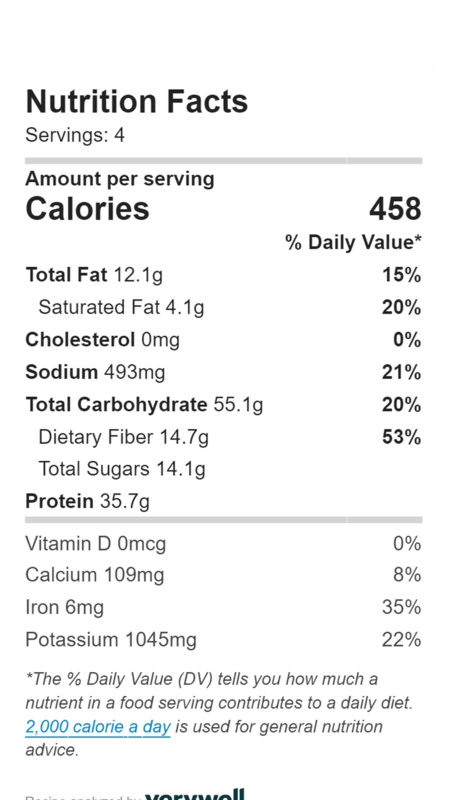 I'm positive that cowboys ate EXACTLY this! Looks delicious! I'm always looking for ideas for these type of bean! It's not one of my default beans so I want to branch out a bit more! These and Black Eye Peas!